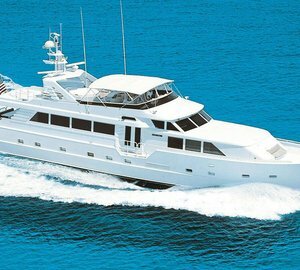 Charter yacht Insatiable was built by Broward Marine in 1985 and she has since undergone a multi million dollar refit in 2000. 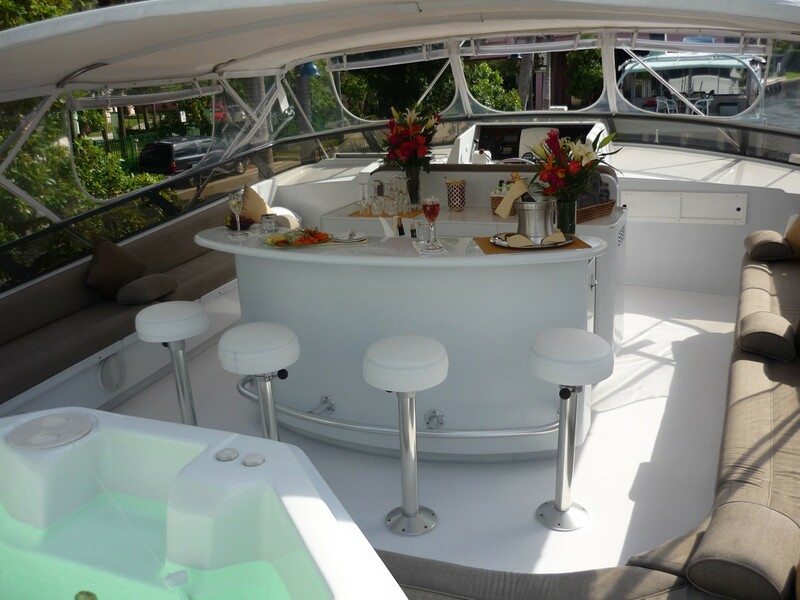 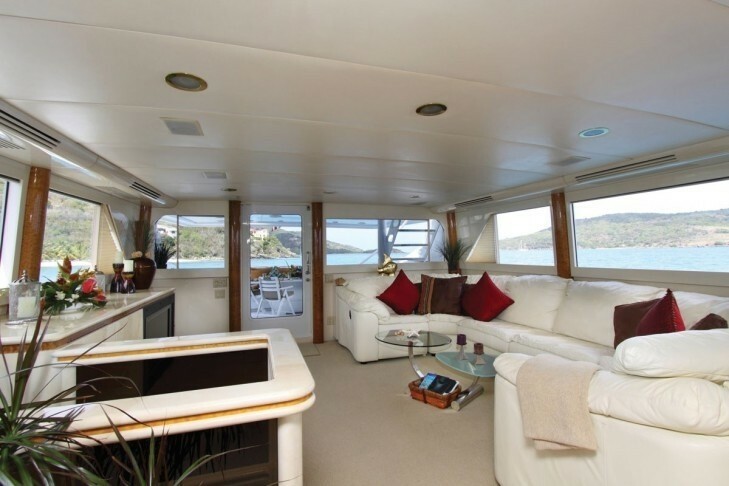 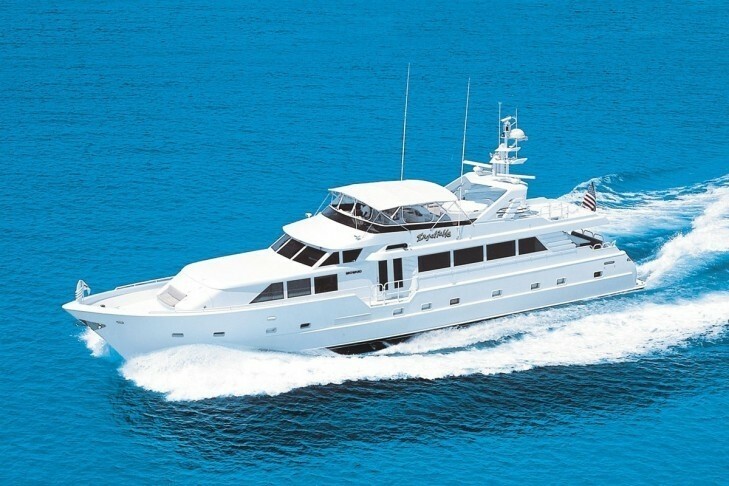 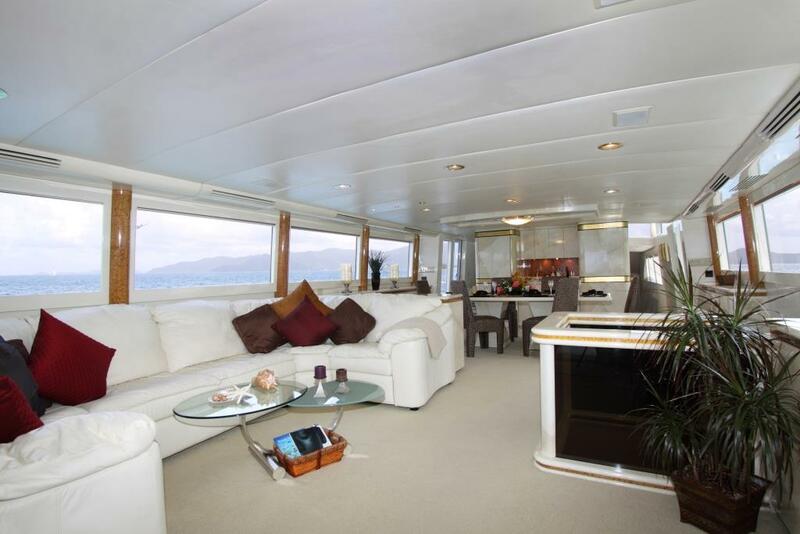 This well equipped motor yacht can accommodate 6-8 guests so is perfect for 3 couples or families with small children. 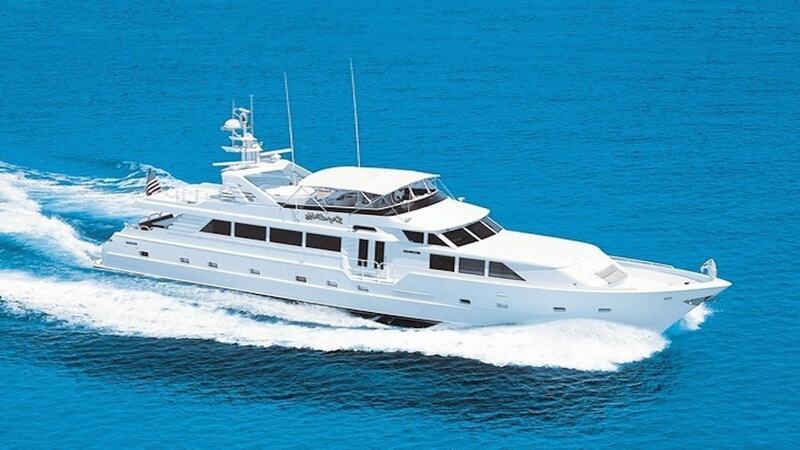 She cruises in both the Caribbean and in the Bahamas. 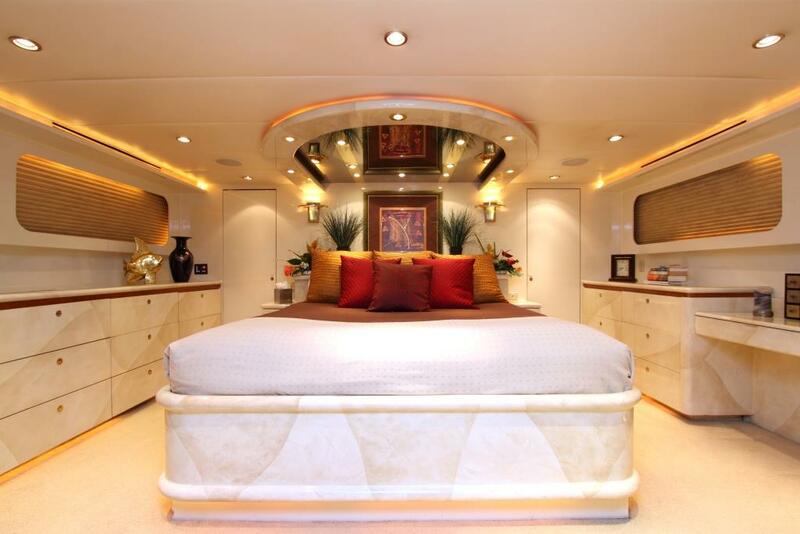 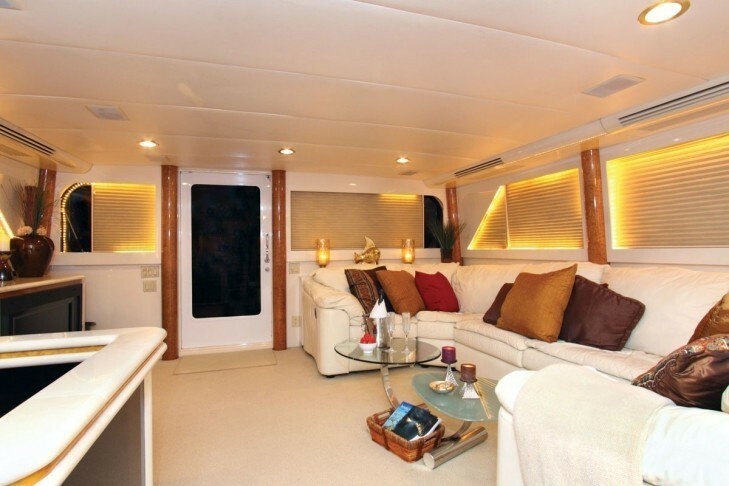 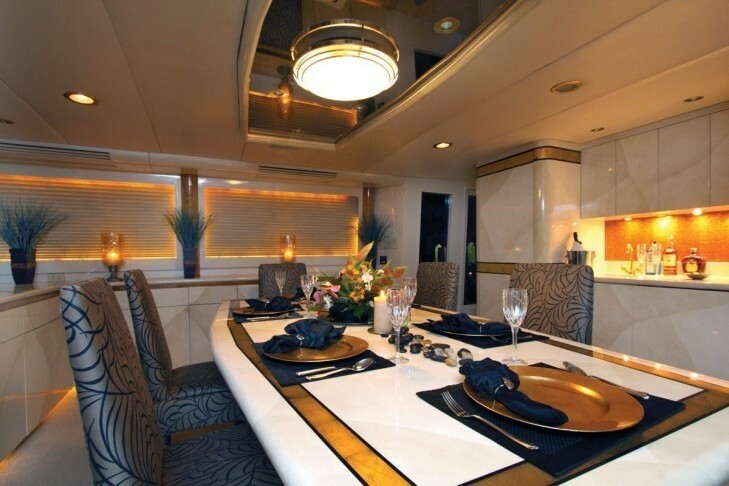 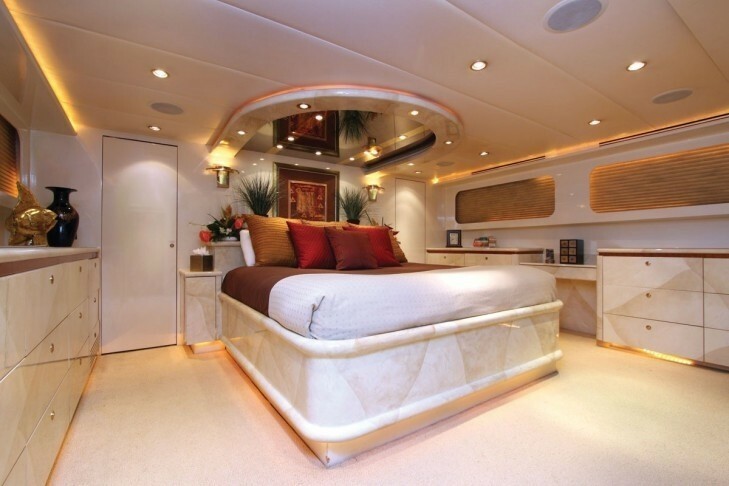 Luxury motor yacht INSATIABLE offers luxurious interior for lounging and dining with soft natural colors through out. 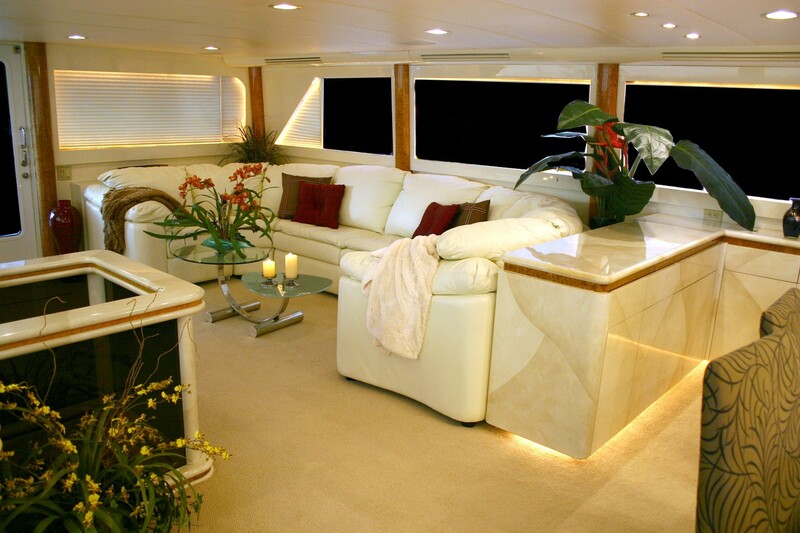 Insatiable’s Main Salon has a large U-shaped sofa, Satellite TV/VCR/Stereo/DVD and a full wet bar. 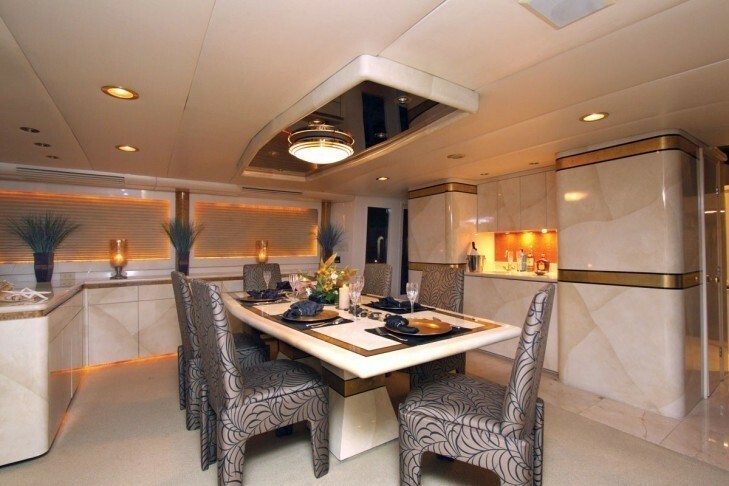 Adjoining the main saloon is her formal dinning area which can seat 8 guests. 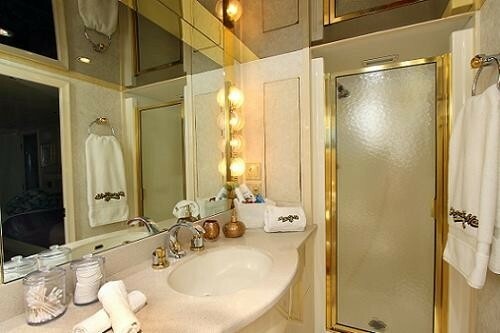 For convenience, there is a day head in foyer. 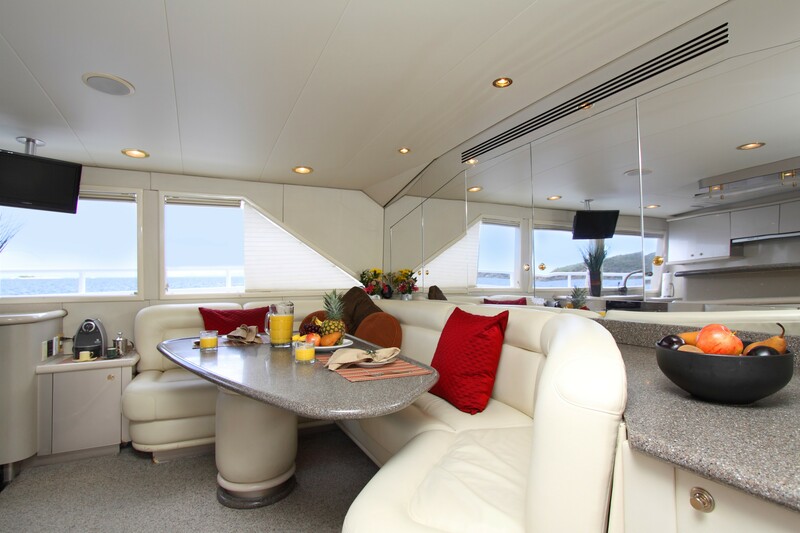 Her country kitchen located forward of the dinning area has comfortable breakfast setting for eight. 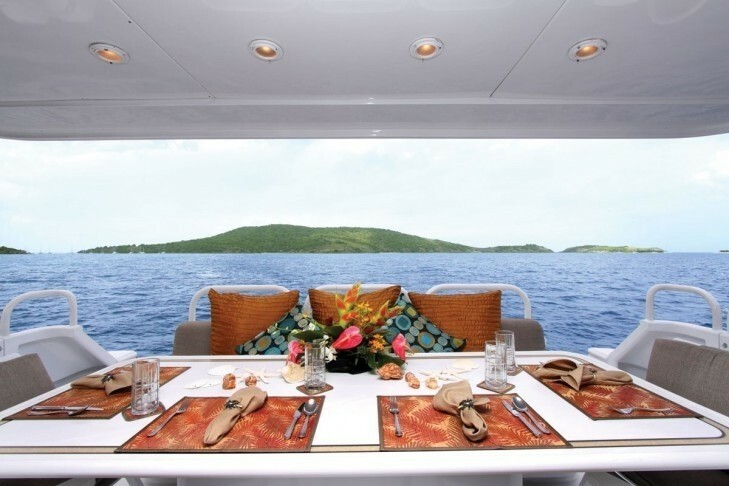 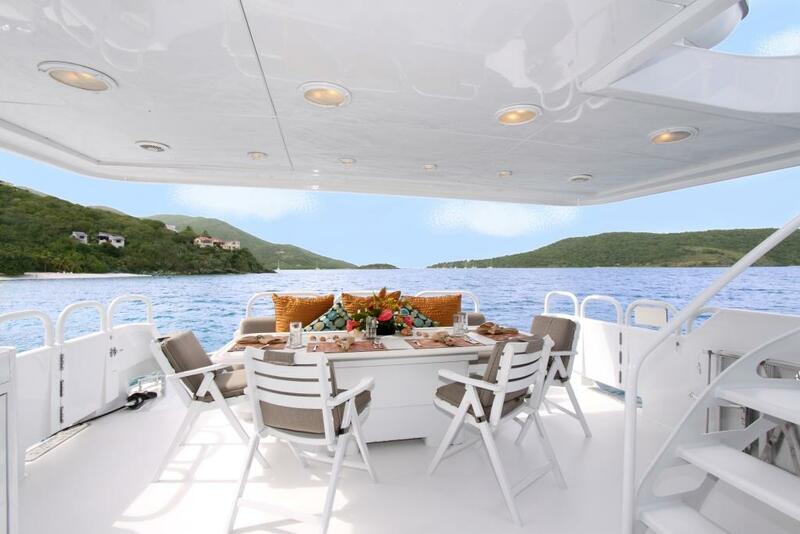 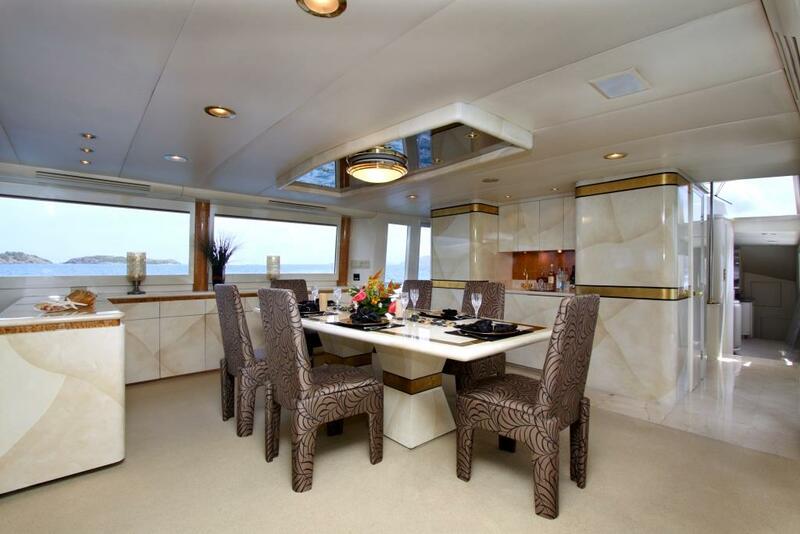 Her covered open-air aft deck provides dining for 6 guests. 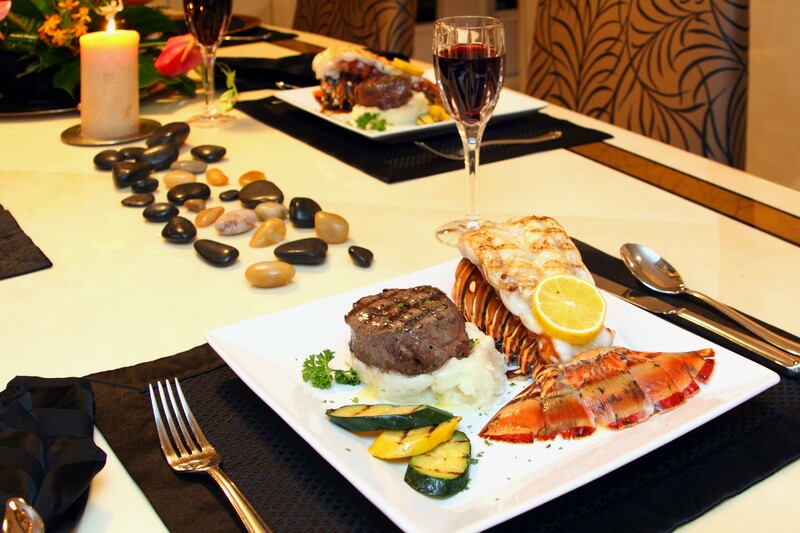 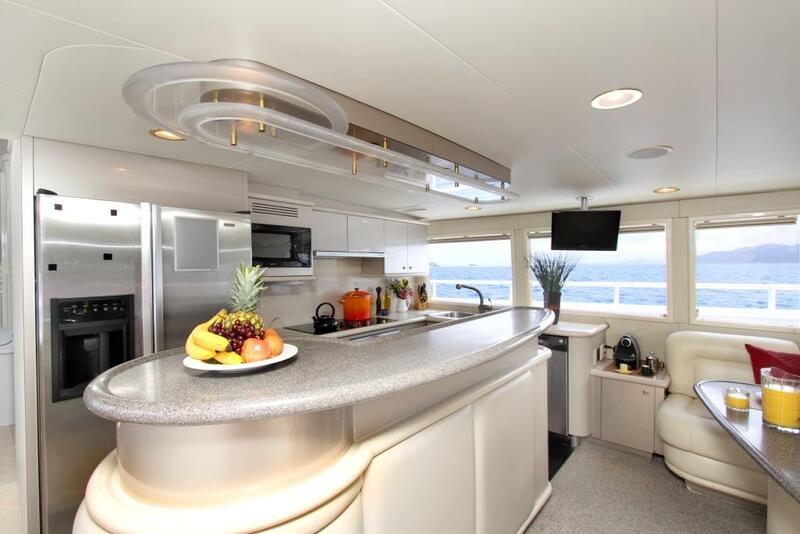 This area also has a Jenn Aire double grill and wet bar. 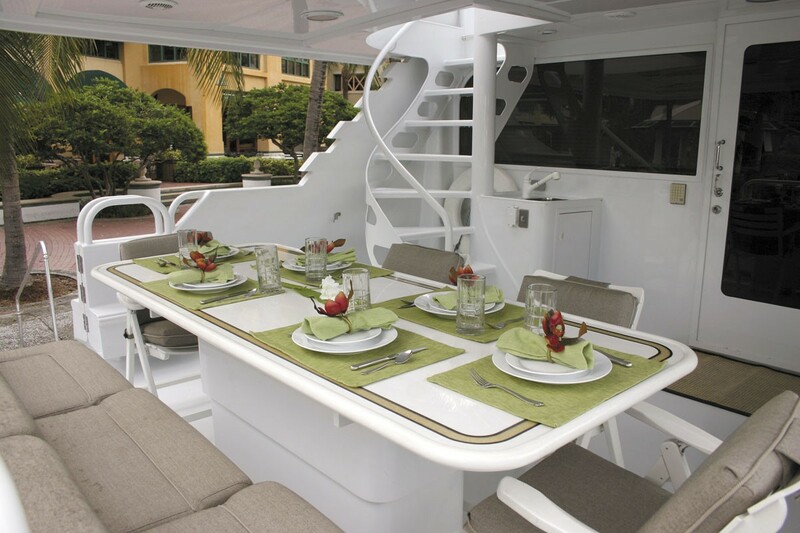 The double spiral stairs provide access to the swim deck and lazarette/dive locker. The ample space on the Flybridge has seating for up to 40 guests, Spa Pool tub for 8, full wet bar, refrigerator and icemaker, BBQ grill and helm station. 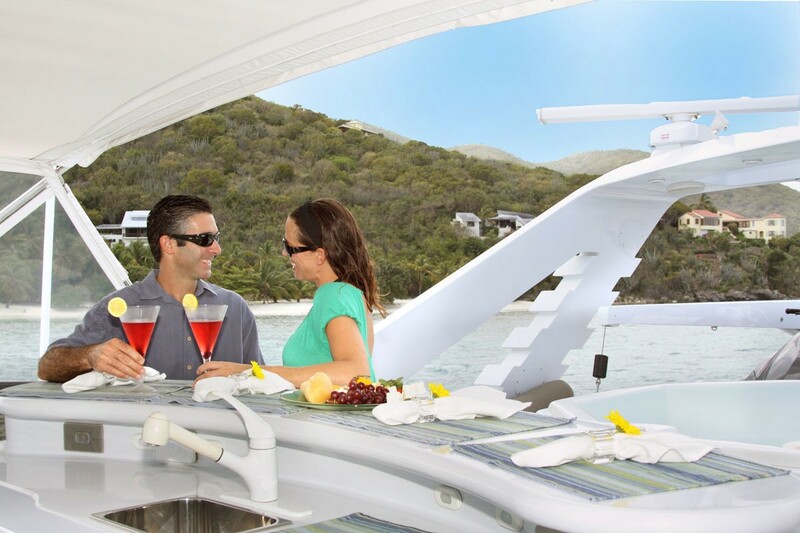 The Forward half of flybridge is enclosed with removable Eisenglass. 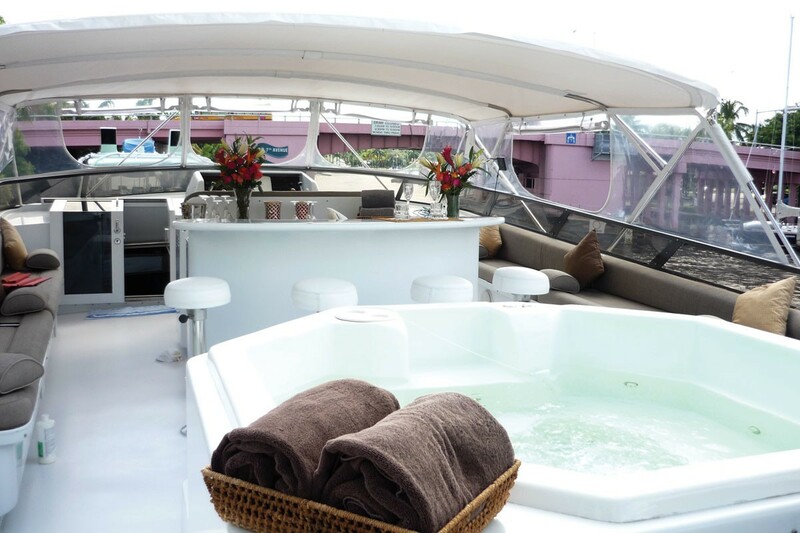 The Forward Deck is another area which provides a sunning area for 4 guests, stereo speakers and a large locker. 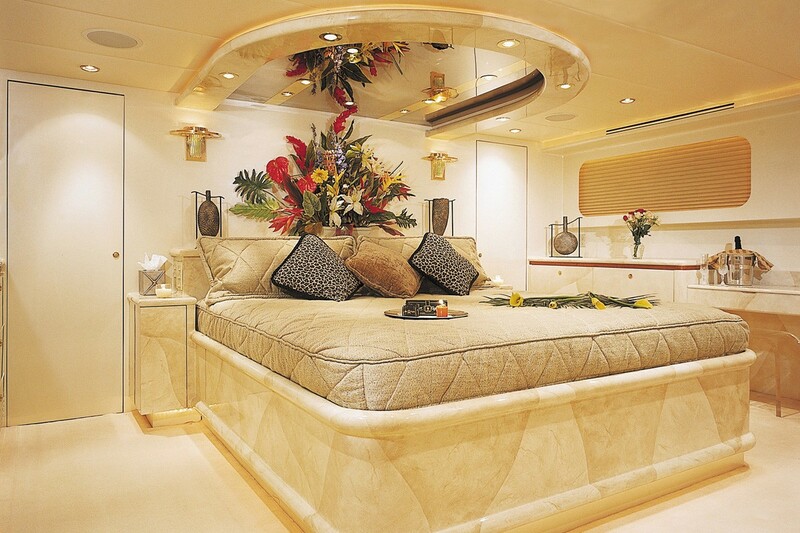 Insatiable is decked with a wide range of toys for your pleasure. Whether you are an avid diver, a snorkeler or love the adrenaline rush from a waverunner Insatiable has it all! 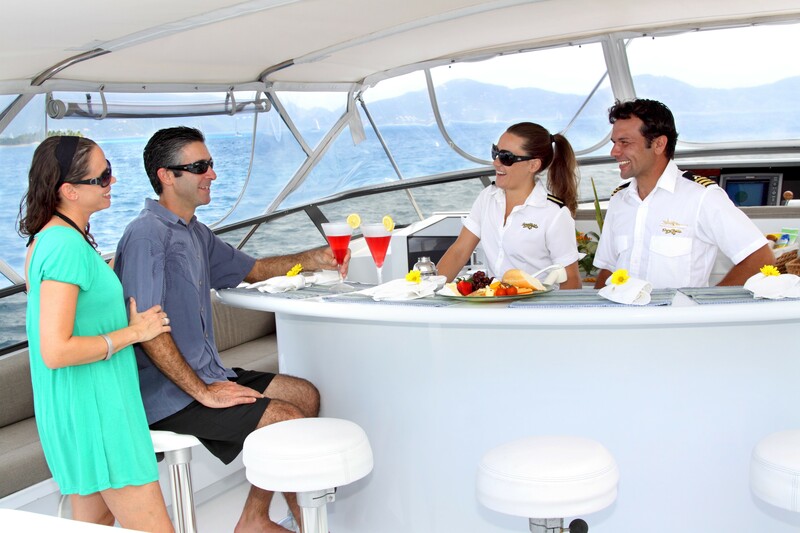 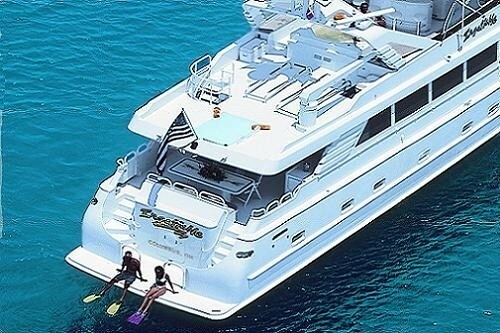 These days there are not many motor yachts that offer on board diving however Insatiable offers Full Certification from on board following successful completion of class and pool work at home. 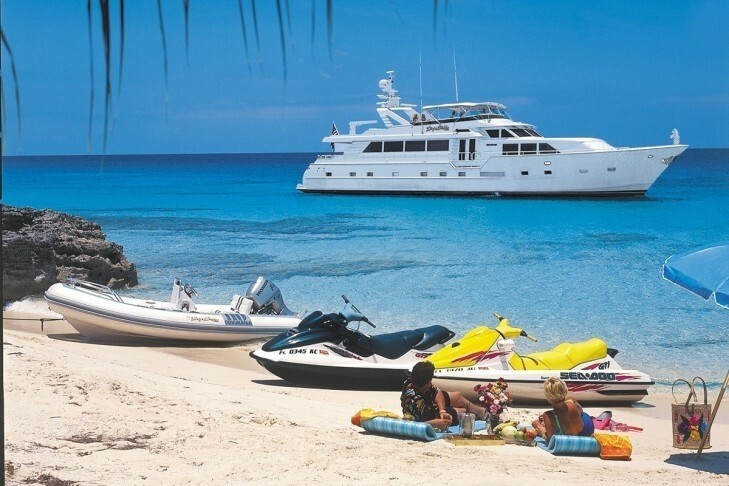 For divers with proof of current dive certificate and DAN/PADI insurance there is diving gear plus (8) new tanks and a Bauer Dive/Airfill compressor available. 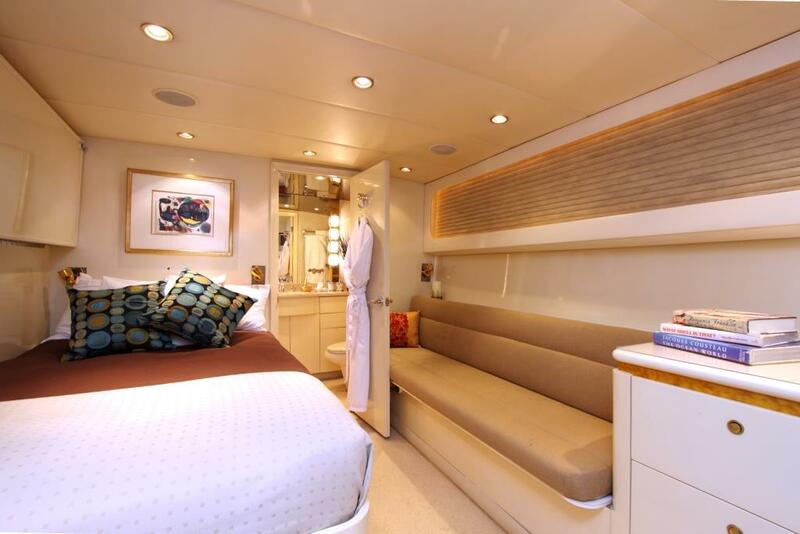 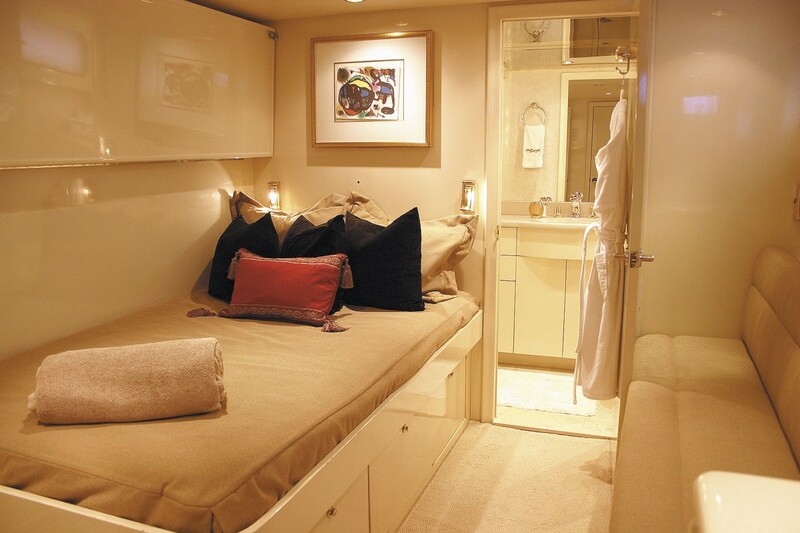 Caribbean and Bahamas based INSATIABLE can accommodate 6-8 guests in 3 staterooms. 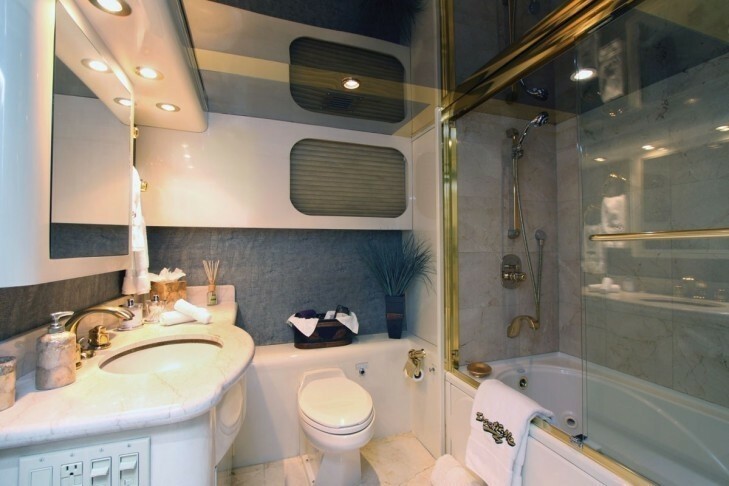 The king size master stateroom located below deck aft is full beam in width and has a dressing table, extensive storage with a walk in closet, full entertainment center with VCR, DVD, DSS, Surround Sound, and an en suite bath with Spa Pool Tub. The two guest staterooms (below deck port and starboard) each have double beds plus a fold down Pullman berth, ample drawer and closet space, en suite bath with shower, Satellite TV/VCR and CD Stereo. 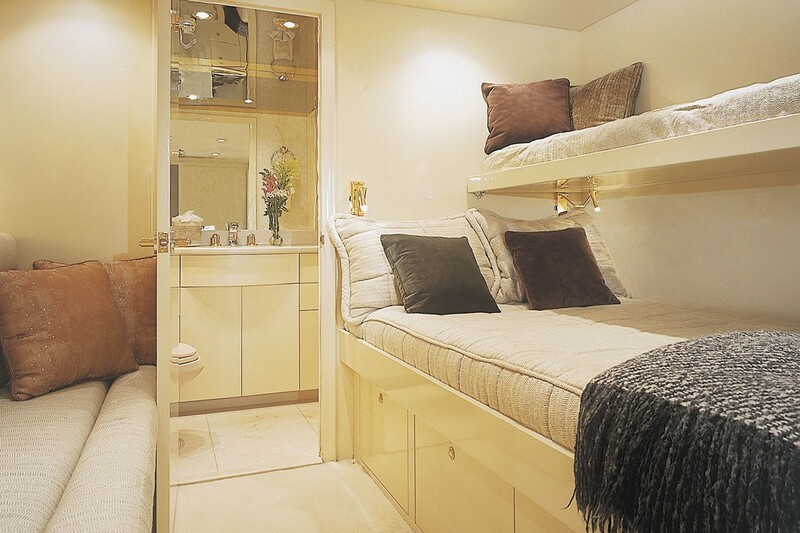 The pullman bunk berth is best suited to a child or small adult. 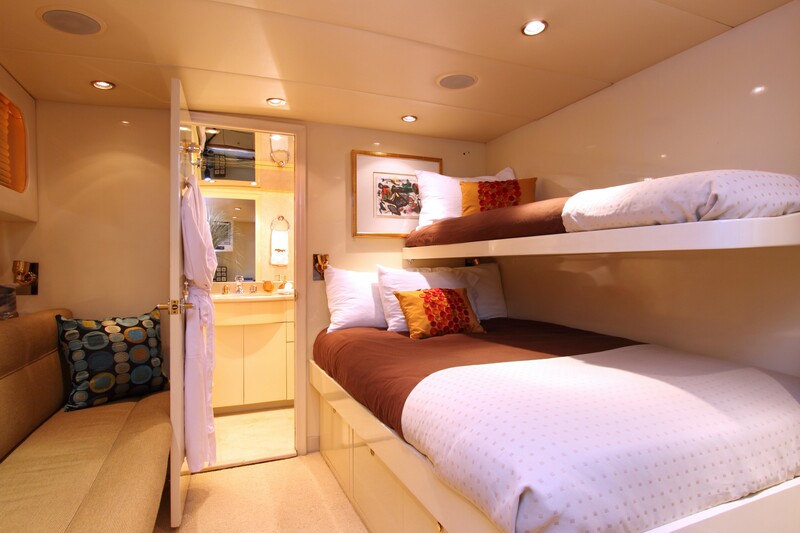 The maximum weight allowed for the Pullman berth is 100 lbs. 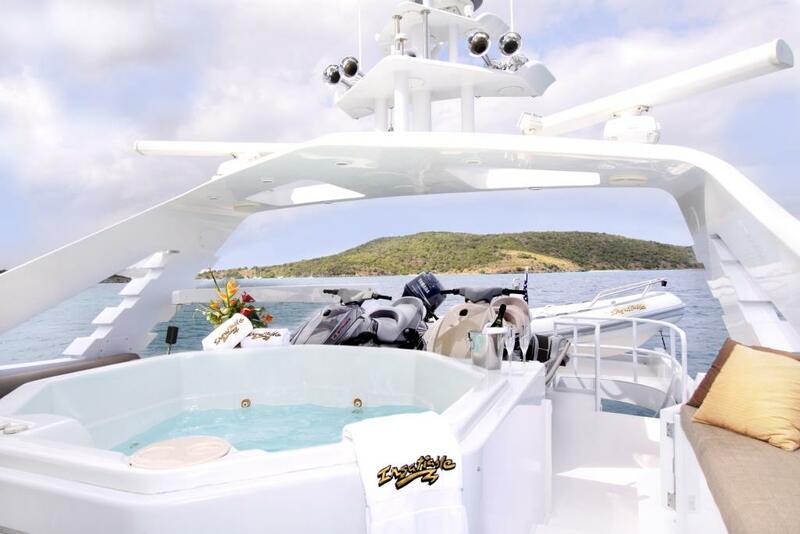 Motor yacht Insatiable has the following Tenders & Toys, INSATIABLE has a 32' Intrepid Center Console w/ 2x 225HP Mercury, 14' Novurania w/50HP, a Waverunner, 2 Single-person Kayaks, Water Skis, Wakeboard, Snorkel Gear, Deep-sea Fishing Gear, Towable Tube / Banana, 3x Large Inflatable Floats and Beach Toys. 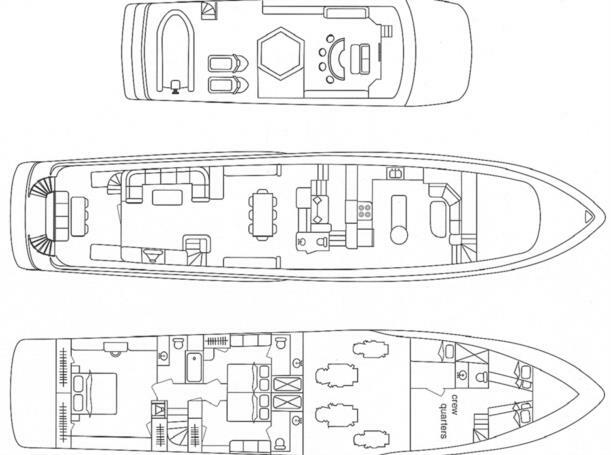 These are designs that became known and respected for being sea kindly and seaworthy, as well as efficient and beautiful. No two Broward yachts were the same - with the slogan “Demand the Finest,” thhis reputation for quality has endured for over 60 years.